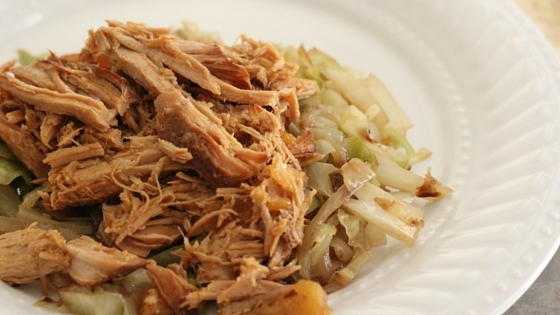 This paleo pineapple kalua pork with butter braised cabbage should be on your next meal plan! It’s paleo-friendly, gluten-free, and totally delicious! We eat a lot of chicken and beef… but sometimes you just need something different. I’d been wanting to get creative with some pineapple and pork roast for a while, so I finally got my hands on a beautiful, pink roast and got busy. My original plan was to make white rice to go with it, but I decided to try something different. Silly me for considering white rice when there was flavor and nutrition to be had. Cabbage is really so versatile and takes on lots of different flavors really well. For another great cabbage recipe, see how to make sauerkraut in a crock (I promise it’s way better than store bought!). I used my favorite non-toxic slow cooker, aka, everything cooker, the VitaClay Organic Multicooker to cook the pork roast. 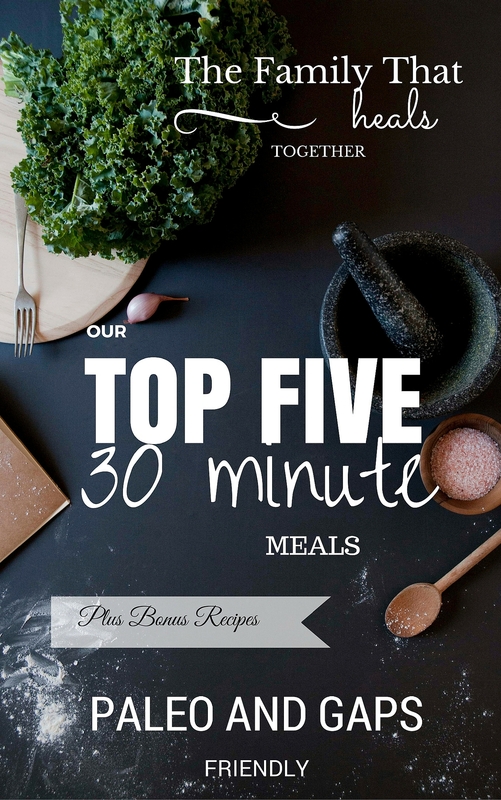 Slow-cooking in half the time (or less!) I can seriously cook a whole pot of beans in 2-4 hours! Non-toxic clay insert. No more worrying about lead in your crock-pot glaze. Multiple functions: should you choose to eat rice (which is totally fine and delicious on occasion! ), the multicooker has a rice setting and cooks rice or quinoa to perfection. It also functions as a yogurt maker, which is perfect for those of us who like to make our own. It keeps the yogurt at the perfect temperature for the prescribed time to create perfectly-set homemade yogurt. So, how did I make this delicious kalua pork in my VitaClay? Update: you can easily convert this recipe to the Instant Pot as well. Just use the “meat” setting and cook for about 40 minutes. You'll need a VitaClay Chef Organic Multicooker and a large skillet with a lid like this. Poke the pork roast with a fork all over to tenderize and prepare it to soak up flavor. Cover it with the smoked salt. Combine the coconut aminos, honey, paprika, garlic powder, chili powder, and salt and stir. Add the chopped pineapple to the sauce. 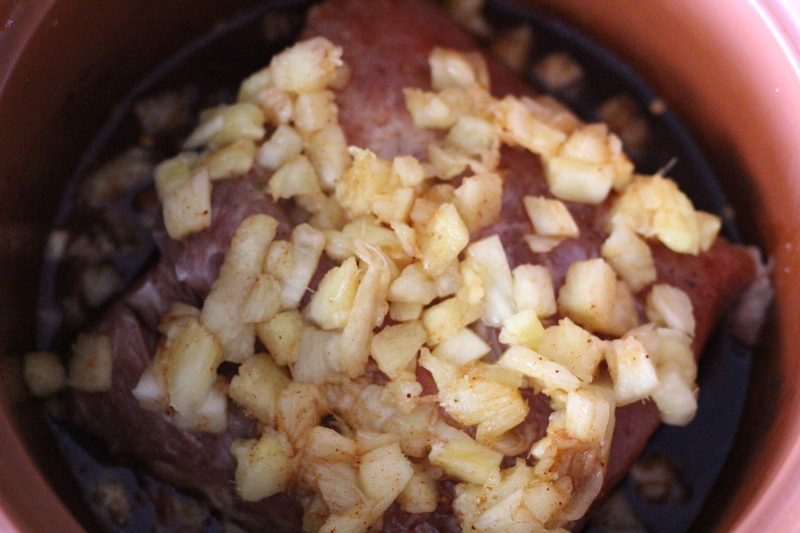 Place the roast in the clay insert of the VitaClay and pour the pineapple sauce over it. Place the lid on the clay pot and close the VitaClay. Turn the VitaClay on the slow cooking setting and select "stew." Set it to cook for four hours. When the kalua pork roast is done, shred it with a fork and let it sit in the juices while the VitaClay is on the warm setting (which automatically kicks on after the cook cycle is complete. 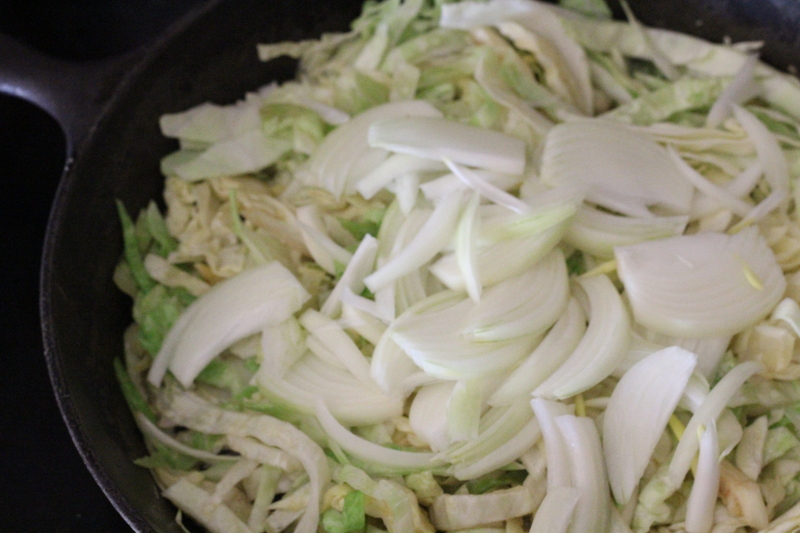 While the pork soaks up the juices, prepare the butter braised cabbage and onions. Start the butter cooking in a large skillet on low-medium. 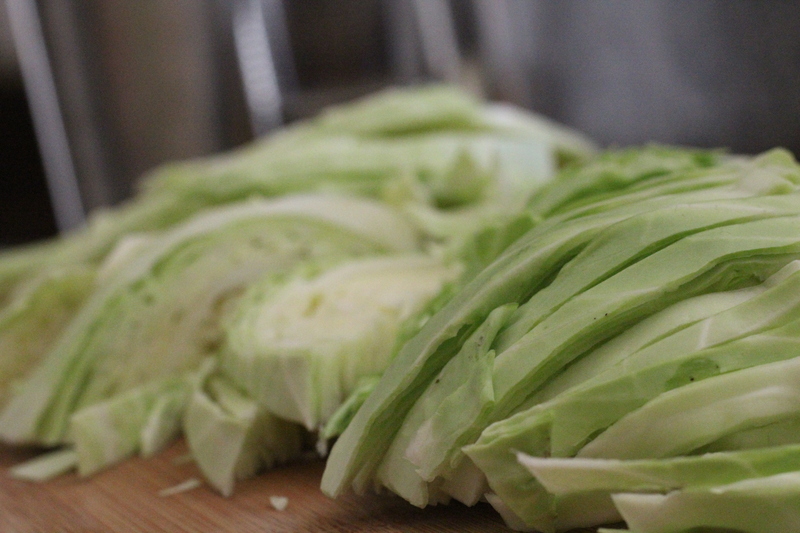 Chop the cabbage and onion into thin slices. Cook the sliced cabbage and onion in the butter, stirring it to make sure you're putting a sear on all sides, then place a lid on the skillet and cook until soft, about ten minutes. 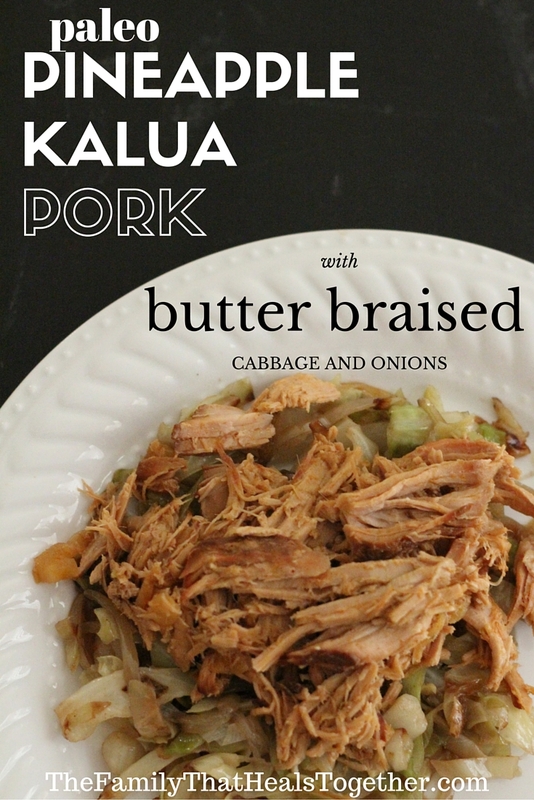 Serve the shredded kalua pork on a bed of butter braised cabbage and onions. Mmm mmm good! Be sure to make these easy five minute flourless blender blondies for dessert! 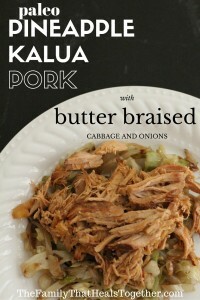 Do you like kalua pork? Share this paleo version using the buttons below! Enchilada Stuffed Sweet Potatoes- Fast, Easy, Healthy!